We're all about the green beans. There is nothing that can quite match the taste of farm fresh green beans. Sure, the prep time is a bit longer than if you were opening a can or using a bag out of the freezer, but it's a real treat and one I like to take advantage of since the season only lasts for a few months of the year. I think it's a joy to cook with the freshest ingredients I can find. We often get asked "how many servings is in a pound of green beans?" What nutritional value do green beans have? 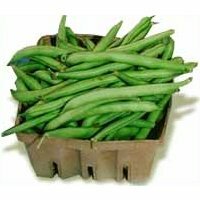 Green beans are an excellent source of vitamin C, vitamin K and manganese. They are a good source of vitamin A and an excellent source of vitamin C, and 3/4 of a cup of is only 25 calories. How can I tell if the beans are fresh? It's very easy to tell if green beans are fresh. They will feel fleshy and firm. Buy the freshest and plumpest beans you can find. When you break them they should have an unmistakable fresh "snap" to them. If you see green beans that are limp and have a wrinkled appearance to them avoid them, they're not fresh. How do I store fresh green beans? When you bring your fresh green beans home don't wash them. This can cause them to develop black spot and spoil. They will keep in the crisper drawer in your refrigerator for three to four days with no problem. Don't wash them until you're ready to cook them. When you're ready to use them run them under cold running water to rinse any dirt off and drain them. What's the best way to cook fresh green beans? Before you decide how to cook your green beans consider their age. Very young and tender green beans, or what are true "haricots verts" should be used in recipes where blanching is all that is called for. More mature green beans can handle longer cooking times. From time to time I get interesting questions from visitors about how to freeze and can green beans. Some are people with experience who have something new happen during the process, and some have never frozen or canned fresh green beans before. Since some of you may have the same questions I decided that I'd post these questions and answers here. Hopefully it will help you. I am far from an expert when it comes to this subject, my expertise comes from "trial and error" over the years. When I am not certain about the answer to a question I go to "experts" for the answers. Credit is given to the source. I'm a first timer,,,,,,when I freeze the beans, I do not blanch them. They go directly from the garden to the freezer after I wash and trim them of course. What does blanching do, and why is it necessary? Green beans can be frozen, dried or canned. Immature beans retain more color and undergo less texture and flavor loss during freezing. All vegetables must be blanched before freezing. Unblanched vegetables quickly become tough and suffer huge nutrient and color loss. Vegetables naturally contain an active enzyme that causes deterioration of plant cells, even during freezing. Blanching before freezing retards the enzyme activity. Freezing does not improve the quality of any vegetable. Freezing actually can magnify undesirable characteristics. For instance, woodiness in stalks become more noticeable upon thawing. Select vegetables grown under favorable conditions and prepare for freezing as soon after picking as possible. Vegetables at peak quality for eating will produce best results in the freezer. I canned my first batch the other day. I followed the Ball Blue Book instructions, hot pack, used a spatula to remove any visible air bubbles, and left 1 inch head space. After pressure canning when I had put the beans on a towel to cool I could see all the beans letting out air bubbles from the inside of the beans. After 24 hours I checked all lids are sealed, there was no leakage. My only concern is that now liquid level is lower inside the jars with some beans exposed. It is as if the liquid displaced the air that was inside the cut beans and risen to the top. Have you ever heard of this happening? Is this a normal thing? Loss of liquid does not cause food to spoil, though the food above the liquid may darken. As long as the jars were processed in the canner for the specified amount of time and they sealed, they should be fine. If, however, the loss is excessive (for example, if at least half of the liquid is lost), refrigerate the jar(s) and use within 2 to 3 days. Sometimes after processing, some of the liquid in the jar is lost and doesn't cover the product. Lost water is most common when pressure canning, especially with starchy foods. Typical causes and solutions are: Packing the food too tightly or loosely in the jar. All bubbles were not removed from the jar before capping. The jars filled too full (too much vegetable/fruit compared to the amount of liquid). In pressure canning: Fluctuating pressure in the pressure canner. Let pressure return to zero gradually, avoiding the sudden release of pressure through the vent. Do not hasten the cooling with cold water. In water bath canning: The jars are not totally covered with boiling water during the boiling water bath processing.